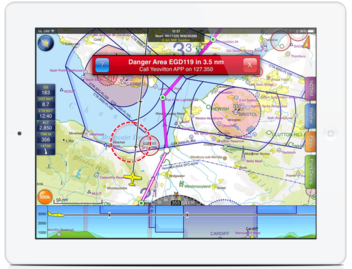 The navigation features in SkyDemon are all designed to keep you safe and well-informed during your flight. You'll spend less time worrying about your navigation and more time looking out of the window enjoying the experience. During your flight SkyDemon will guide you effortlessly between your waypoints and notify you of potential hazards. At your destination airfield you can take advantage of georeferenced plates to make an approach using a detailed local map as a guide, or simply use them to navigate your way around unfamiliar taxiways. Product documentation, tutorial videos and community discussion forums are available. We provide charts free of charge as part of all subscriptions. Check here to see which charts we offer. Our software is frequently updated. Check here to view the notes associated with each new version in detail. Read more about SkyDemon's navigation features below, or simply start using SkyDemon today. You may find yourself flying further afield - exploring new regions and even countries - because the SkyDemon charts are presented in the same style no matter where you're flying. They are clearer than any other product, and look fantastic whether you prefer north-up or track-up orientation (it's easy to switch). They are dynamic and adapt themselves as you fly, removing irrelevant details and airspace thousands of feet above where you are. 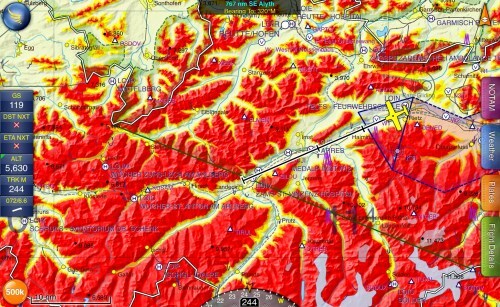 Switch on TerrainSafe if you're flying in the mountains and the terrain in the background of the map will spring to life, showing you instantly the relative altitude of the terrain compared to your own. This feature has been described as life-saving, as if the weather closes in unexpectedly it can be crucial to pick the correct valley to fly down. 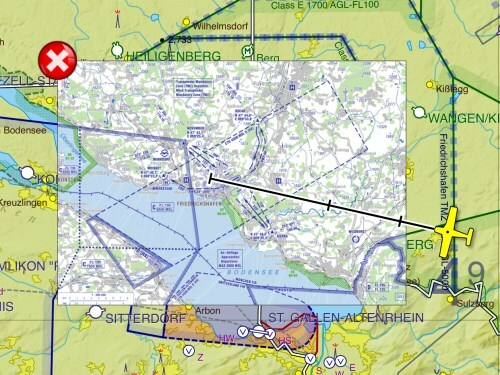 Our GlideSafe feature can bring you comfort over the sea or in mountainous terrain by showing a rough circle around your aircraft indicating where you could glide in the event of an engine failure. The SkyDemon charts are comprised of many individually-selectable layers and are therefore adjustable to your preferences. They even change as you zoom in and out, making sure the right features are displayed in the best possible way. Arguably the most significant instrument in SkyDemon, virtual radar comes to life when you are in navigation mode. It continuously sends out virtual pings into our aeronautical data and presents the returns in a dedicated instrument at the bottom of the screen. It shows a real-time projection of your trajectory ahead relative to terrain, airspace, NOTAM, ground-based obstacles and other features. Your vertical speed is clearly represented, making it easy to see where your climb or descent will take you over time. In the background your planned route is visible, so you can see when it's time to begin a long climb or descent to achieve a specific level at a specific time. If you're flying towards controlled or dangerous airspace you'll see a warning including advice on which service to call to gain penetration where available. We also include NOTAM warnings so you'll even be kept safe from temporary hazards which may only have been notified on the morning of your flight; things like aerobatics and military training. If you're flying at lower levels you'll appreciate our obstacle warnings. The instrumentation while you're flying is designed to be simple and show just what you need. A simple direction indicator with a bug on its compass rose is all you need to stay on course. Other instruments show the wind conditions outside, distances and timings left to run. A permanent position report makes it easy to give ATC a plain-English description of your position at any time. A touch on the position reading takes you straight to the Live PLOG. This document is updated in real time with your progress through your planned journey. It shows your ETA at all future waypoints, and your ATA at waypoints you have passed. It shows the frequencies you might need based on your current position and altitude, including all Flight Information Services. It shows the radio services offered by all nearby airfields, all updated in real time. 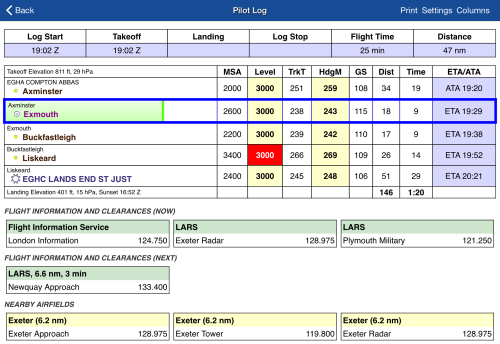 Because the Live PLOG is much like the Pilot Log you will have used when planning your flight, you can use it to make changes to your route too. This can include taking a shortcut straight to a waypoint further on in your route because you have gained a clearance, or inserting a new waypoint between two others because you need to avoid something. If you should have a sudden need to divert, you will bring up the Direct To feature. This quickly lists all nearby airfields with their longest runways, and at the touch of a button you can instantly plot a route directly to the destination of your choice. A valid NOTAM briefing will still be available even if you don't have an internet connection, because SkyDemon stores all NOTAM for the FIRs you will be flying in. As you draw near to your destination you'll notice extended centrelines from the runways projecting out on to the map. These are a useful tool to orient yourself relative to the runway and circuit pattern early. For larger airfields you can even nominate an approach runway and use our pseudo-ILS feature to precisely line up on the extended centreline, helping to ensure a smooth and steady descent. A wealth of documentation is available at your fingertips for every airfield, and especially your destination. Simply touch the information button next to the airfield to be taken to the Airfield Information screen, where you'll see the runway layout, frequencies, elevation, local weather, applicable NOTAM and available plates from the AIP and third-party publishers. Many airfield plates include a richly detailed local map, either for approach or airfield diagram purposes. Most of these are georeferenced, which means you can embed them into your SkyDemon chart at the touch of a button and fly inside them. This is hugely beneficial for spacial awareness, and can help you make a textbook approach or navigate your way through a confusing system of taxiways once landed.